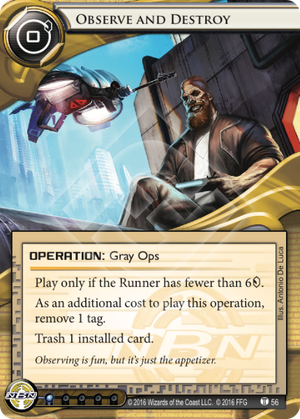 Play only if the Runner has fewer than 6credit. Observing is fun, but it's just the appetizer. Can Observe and Destroy trash a Corp card? Fisrt, it need to ne comboed with ca. And then u can trash any cards u want. So it means temporary tags punishes like breaking news Should be scored with 2 clicks left. The question is u really need to trash runner card when u hit ca? The target will be their core breaker or hardware. But their at 0 credit now, With no resource if they r tagged. They can't afford breaker already. It means this card is overkill. It will be useful for magnum opus, But shapers have clone chip. more bad knews is anarchs have a recrsion,too. And there is 1 more usage for it. That means u destroy plascrete, or even 'city hall' with accelerated diagnotics, without removing tags for boom. The problem is that 'runner fewer than 5credit condition' is still remaning, Which involves ca =tag. Maybe u can combo it with reversed account.